Beginning in the early 1990s, Metropolitan Water District established a number of groundwater storage programs in the Central Valley and on the State Water Project which have provided substantial water supply benefits through the years. At the August meeting of Metropolitan’s Water Planning & Stewardship Committee, James Bodnar, Manager of the Supply Acquisition Team, provided an update on the groundwater banking programs. His presentation provides insight to how groundwater banking operations can interface with water management operations, as well as the benefits and risks of such programs. Metropolitan has five State Water Project groundwater storage programs: Semitropic Water Storage District, Arvin-Edison Water Storage District, and Kern Delta Water District which are located along the main stem of the California Aqueduct, and the Antelope Valley-East Kern Water Agency program and the Mojave Program, which are located further south on the East Branch of the California Aqueduct. Metropolitan receives many benefits from these groundwater storage programs, the most important benefit being that these programs help manage supplies by taking surplus water in years when its available and converting that to dry year supplies, thereby increasing regional reliability. The groundwater banking programs also provide emergency supplies while remaining cost-competitive with other alternatives. The graph on the lower left shows how the groundwater banking program has developed since 1994. 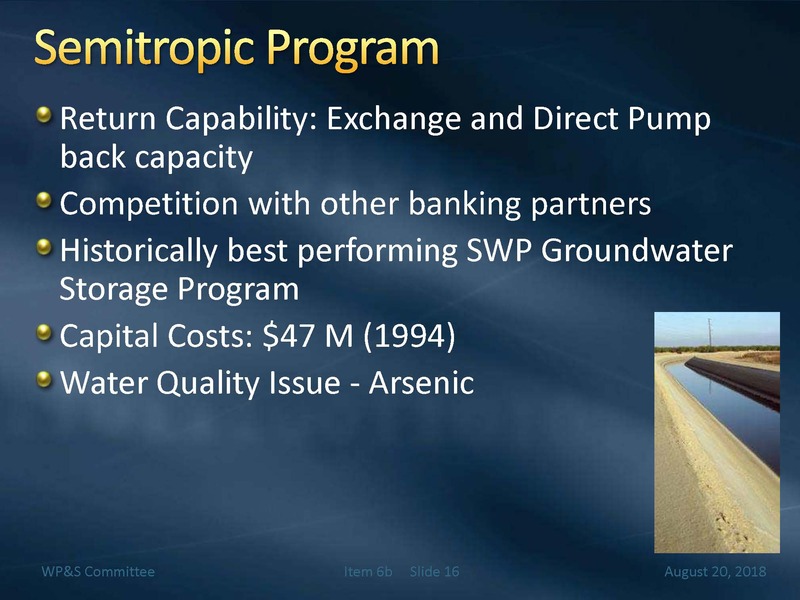 Semitropic was Metropolitan’s first groundwater banking program; next was the Arvin-Edison Program, followed by the Kern Delta and Mojave program. Most recently, in 2016 the Board authorized the Antelope Valley-East Kern program (AVEK), which is relatively small, compared to the others. The historical takes from all of the groundwater banking programs is a little over 1 million acre-feet; currently there is 500,000 acre-feet in storage. Maximum storage capacity is 1.3 MAF. Emergency reliability is important, and location is key; Mr. Bodnar noted that all of these programs are located south of the Delta. The ability to do direct pumpback is also critical for emergencies; direct pumpback refers to having wells that can pump when needed to get the wet water back into the California Aqueduct. The groundwater banking programs provided important emergency reliability benefits when back in 2016, there was a failure in the California Aqueduct which caused the aqueduct to be shut down for a month and a half. A large section of the California Aqueduct was completely shut down, with no flow downstream of the damaged area, except for the groundwater storage programs that were pumping in, the Arvin-Edison program being one of those. Groundwater storage programs are cost-competitive with other dry-year alternatives, Mr. Bodnar said. The full cycle costs – the put costs, the take costs, and the associated energy costs – run roughly around $300 per acre-foot, which tends to be much lower than the cost of dry year transfers. He noted that this year, there was an opportunity to purchase north of Delta transfers at a price of around $400 and acre-foot; factoring the 20% losses associated with that, it would have been about $500 an acre-foot. “So we can use our groundwater storage program strategically to figure out is it time to buy transfers or can we rely on our storage, and this was one of those years that our storage really paid off,” he said. The capital costs associated with groundwater storage programs are lower than those with surface water reservoirs, he pointed out. However, groundwater banking programs do come with risk factors that need to be taken into account, such as the return capability, water quality issues, and termination dates of the agreements. He then discussed each one in turn. Mr. Bodnar noted that during the recent drought, there was a lot of competition in the storage programs with other state water contractors. “In low allocations, we’re all competing for the same resources, so that’s something to consider,” he said. Uncertainty in the water supply conditions is another factor to be considered. Typically, the State Water Project allocation isn’t really known until April or May, so there could be some uncertainty that limits decision making in terms of when they start receiving water from the banking programs. He noted that Metropolitan staff tries to anticipate the allocation and the runoff. “We try to reduce that uncertainty but that uncertainty exists because it’s really hard to predict the weather,” he said. Another issue that can impact the return capability is the water quality. The Department of Water Resources manages the State Water Project for the benefit of the downstream users, so just as Metropolitan wouldn’t want upstream users putting water in the aqueduct that is high in TDS that would impact their member agencies, Met has to look at how the storage programs are operated so that they aren’t impacting any other State Water Project contractors that are downstream. Water quality can degrade while in storage if there’s a water quality contaminant or constituent of concern that’s already in the basin, but more perhaps more impactfully, water quality standards are changing. As new water quality standards are implemented, new testing is required with the pump in programs and they have to meet those requirements, Mr. Bodnar said. The termination dates of the agreements is something to keep in mind. 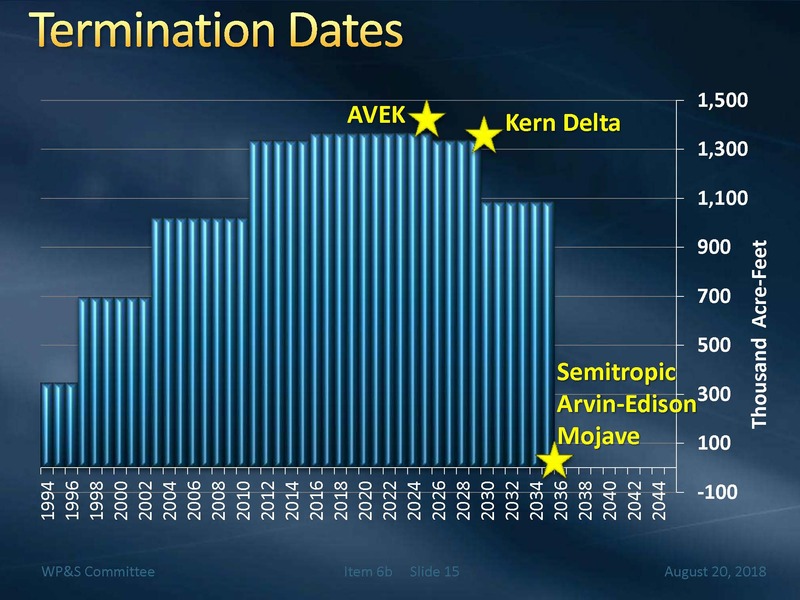 Mr. Bodnar noted that AVEK is a small program that terminates in 2026 and Kern Delta terminates in 2029, but the majority of the contracts’ termination dates coincide with the current contract term on the State Water Project contracts, so if the contract term extends, Metropolitan will be looking to extend those agreements. The Semitropic program has return capability by both exchange and direct pumpback, so there is flexibility. However, Metropolitan has experienced competition with other banking partners; there are other state water contractors that are involved in that program, and during the recent drought, Met competed for the same limited return capability. The capital costs for the Semitropic program was about $47 million in 1994 dollars; in today’s dollars, that would be roughly $100 million. The water quality issues experienced with Semitropic has been arsenic which came about after the EPA changed the MCL for arsenic from 10 parts per billion to 50 parts per billion. “Effectively overnight, we had an arsenic problem,” Mr. Bodnar said. 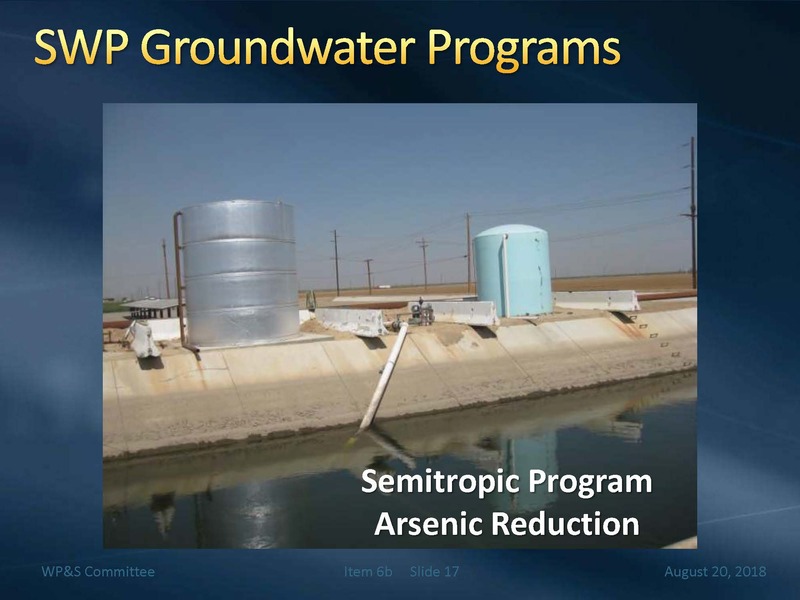 However, he noted that Semitropic has been very creative in addressing the arsenic issue, developing an in-canal arsenic treatment system that reduces the arsenic loading in their system before it gets to the aqueduct. “It adds about $25 an acre-foot to our treatment costs, so it still keeps the program cost competitive,” he said. 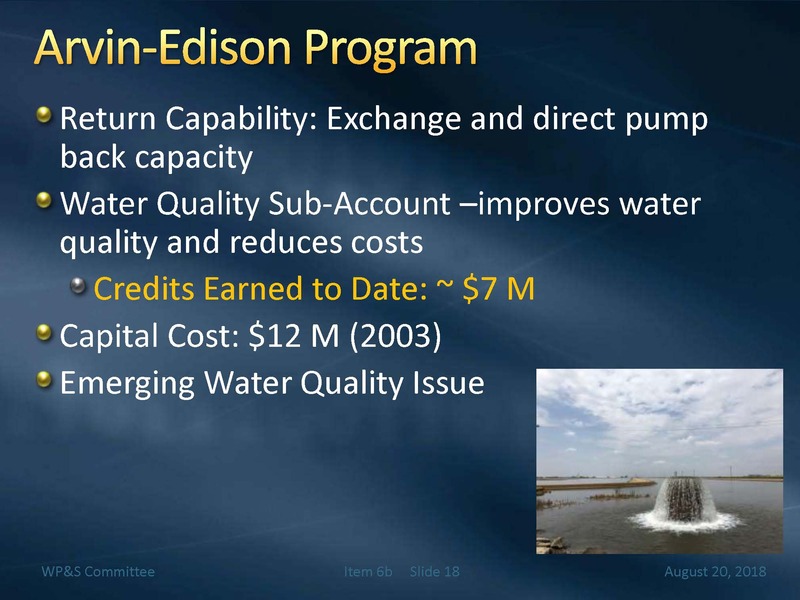 The Arvin Edison Banking Program has return capability by both exchange and direct pumpback capacity. A water quality sub-account back in 2007 was developed as part of that program which improves water quality by providing water lower in TDS, bromide, and organic carbon, Mr. Bodnar said. He noted that they also were able to negotiate some credits. “As we operate the water quality sub account, we get a credit, and we’ve accumulated 7 million credits, and we’ve used those credits to reduce your costs on flip side,” he said. He noted that the capital cost of the program was $12 million in 1997 which was for building the intertie pipeline. Mr. Bodnar said there is an emerging contaminant issue with the Arvin Edison Program. 1,2,3 TCP was a component in a fumigant that was used on row crops in agricultural areas, including Kern County. Recently, the State Water Board issued a new MCL for 1,2,3 TCP which has an extremely low MCL of 5 parts per trillion, which is equivalent to filling the Rose Bowl with 150 million gallons of water and adding 3 milliliters or ½ a teaspoon or a thimble of 123 TCP. “It’s a pretty potent constituent of concern that we’re looking at, and there will be some further discussion in legal and claims with this board to go into more detail and provide more background into possible actions,” he said. 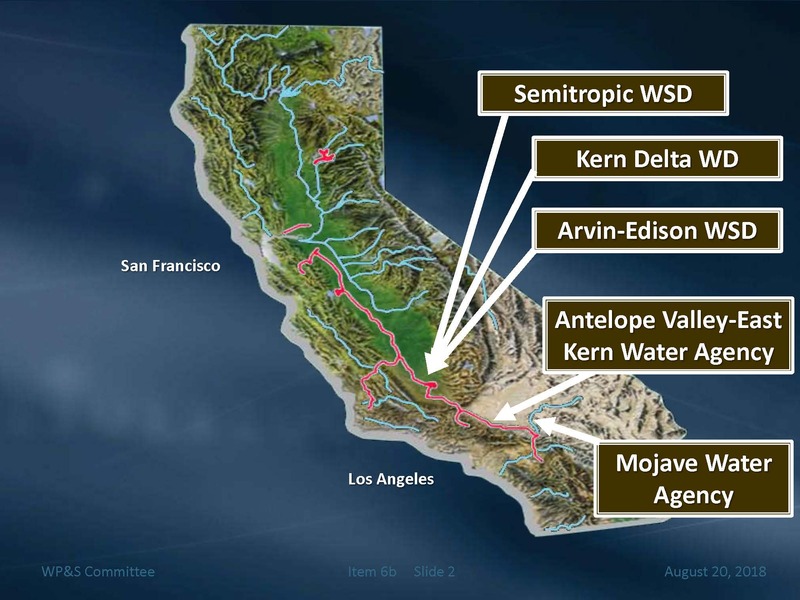 He acknowledged that they are focused on this issue with Arvin-Edison right now, but it could also be of concern for neighboring groundwater storage programs, such as the Kern Delta Water Agency, which is right next door. The Kern Delta Water Agency returns water mainly by exchange, so if there is a 1,2,3 TCP issue, Mr. Bodnar said they could likely get a lot of water out by exchange. There is some limited direct pumpback capacity that could be impacted. 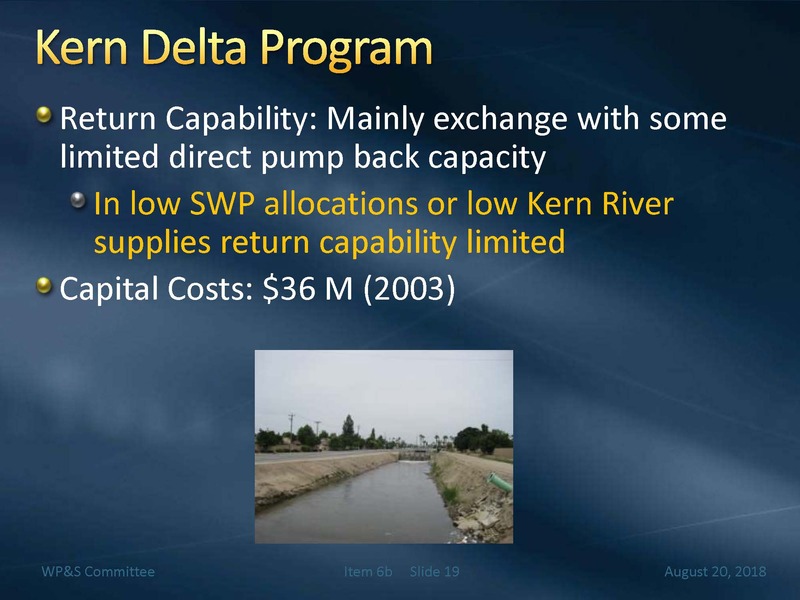 However, because of that and low State Water Project allocations and low Kern River supplies, the return capability might be limited. There was a capital cost associated with this program of $36 million in 2003 dollars. 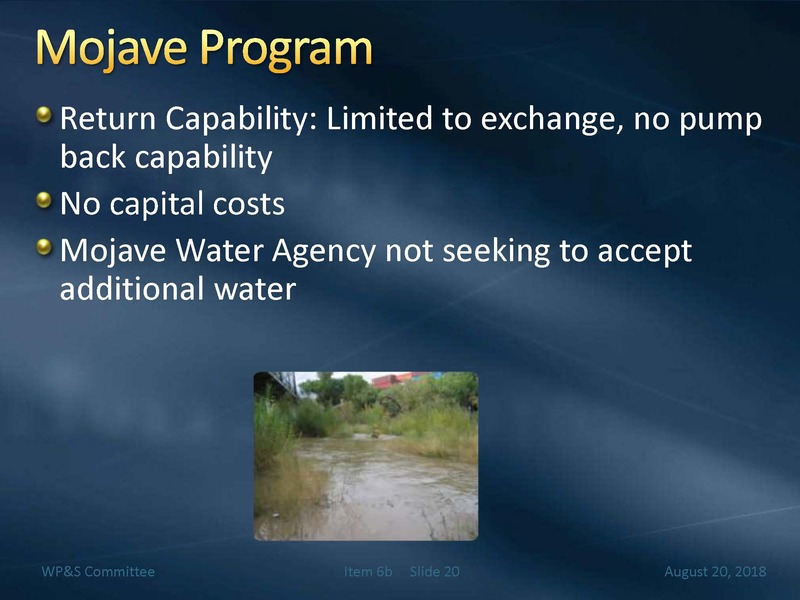 The Mojave program is completely limited by exchange. 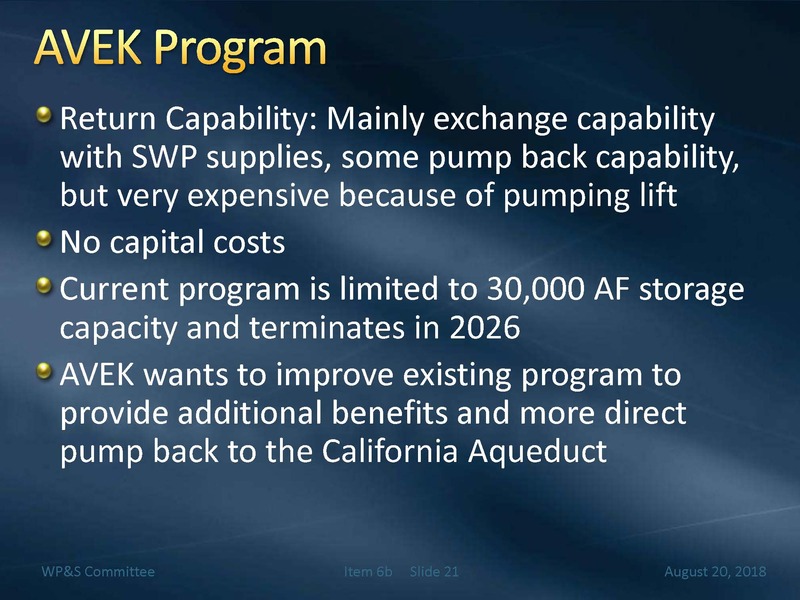 Mr. Bodnar said that there’s no pumpback capability to this program and there are no wells that can return water to East Branch of the California Aqueduct. At the same time, there were no capital costs, so no financial risk. 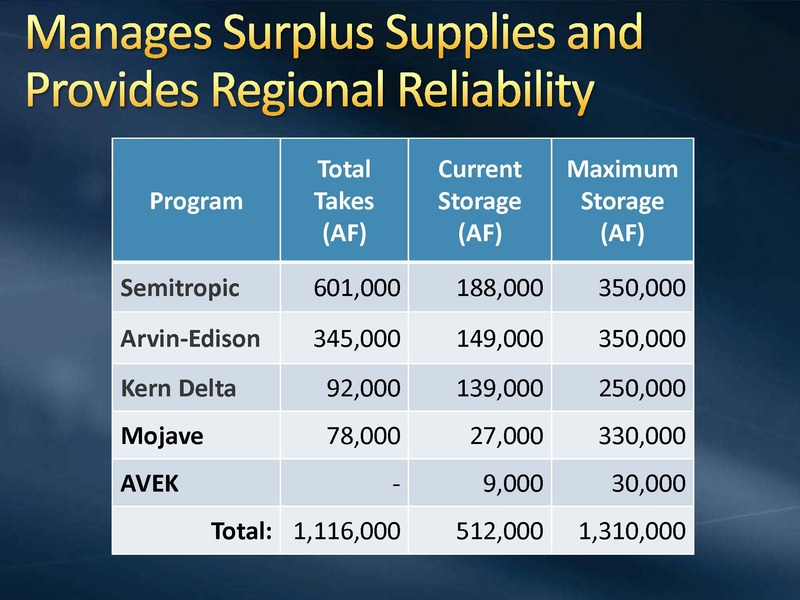 The Antelope Valley-East Kern (AVEK) Program’s return capability is mainly by exchange. While they do have pumpback capability, the wells are located far away from the California Aqueduct and a pumping lift to get there. There was no capital costs associated with this program, so there was very limited financial risk to Metropolitan. The Kern program is relatively small at 30,000 acre-feet. The program will terminate in 2026, but they are in discussions with AVEK to improve and extend the existing program. During the discussion period, Director Fern Steiner asked how the groundwater banking programs performed during 2015 and 2016. Were there any issues on taking water out? For more on groundwater banks from Maven’s Notebook, click here. For agenda, meeting materials, and webcast of the August meeting of Metropolitan’s Water Planning & Stewardship Committee, click here.